Making a really moist gluten free bread is pretty exciting as many gluten free recipes tend to be a bit dry, but this is very moist and sweet! Hopefully this one becomes a fast favorite in your home as it is in ours. Line a large bread pan with parchment paper. Shred sweet potato and zucchini. Sift flours, cinnamon, baking soda, baking powder and salt into a small mixing bowl. In large bowl, beat together coconut palm sugar, applesauce, eggs, coconut oil (melted but not too hot) and vanilla. 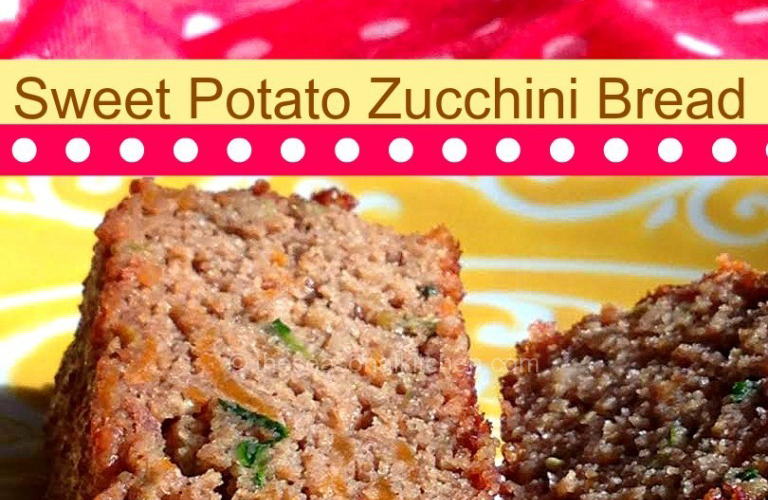 Mix in sweet potato and zucchini. Add the sifted dry ingredients and mix well. Pour into a loaf pan and bake for 60-70 minutes or a knife inserted into the center comes out clean. Cool in pan on rack for 15 minutes. Lift the bread out by the parchment paper and cool completely. Hold in the fridge in an airtight container. *Note – You may tent your loaf with foil the last 15 minutes to prevent it from getting too dark. **Note – The original recipe called for 2 cups of white flour instead of the quinoa and almond flour so if you’re not gluten free you may want to try it with a traditional wheat or white flour.